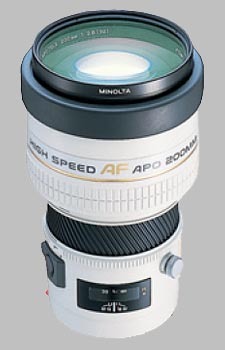 (From Konica Minolta lens literature) This compact mid-telephoto lens uses AD (Anomalous-Dispersion) glass elements, which provides apochromatic correction for top-quality images. In addition, its large maximum aperture enables shooting in low-light situations and its inner autofocusing element provides fast, precise focus adjustment. A focus-hold button is conveniently located on the side of the lens barrel, and adjusting the focusing range is easily done using the focusing range ring. This is one of Minolta's best. It is relatively small for 200mm, fast and has exceptional IQ at all apertures. If you are seriously into the Alpha mount, you "need" this lens! Seriously consider this one over the 70/80-200's. Most of the time, you'll leave your zoom at 200mm anyway and this prime is lighter and less than half the price on eBay. Sharp, lightweight, fast-AF, among the sharpest 35mm optic ever produced. The color and the resolution are beyond words.